That's right, I'm back with more. Seeing as how there are enough Simpsons Christmas episodes to fill a list, I figured we'd need to spread the love around to some less thought of holiday classics. And yes, I use the term "classic" useless but dammit it's Christmas! Sure, this episode features a pretty thankless storyline with Penny and Leonard, but everything is wrapped up with a great exchange that remains one of my favorite moments in the shows history as Sheldon is gifted a used napkin signed by Leonard Nimoy. I can understand the criticism that this show receives but there's not much better than seeing the joy on Sheldon's face as he receives the gift as it reflects the ultimate "great gift" reactions of our lives. Yeah, I had to do more than one Simpsons episode, it's just the law. It's like if I were to do a Halloween episode list, there's no way there wouldn't be multiple Treehouse of Horror episodes on it. The Simpsons has always known how to do a holiday right and this episode only stood out to me recently. The entire episode revolves around the idea of consumerism in religion and deciding a religion based on your own personal views, rather than based on the society around you. It's a powerful message and one that was lost amongst my younger self who just viewed it as "The Richard Gere Buddhist episode." Thankfully I'm able to appreciate it more now. I had a hard time just choosing one King of the Hill episode, mainly because I'm a tad bias in that I consider it the greatest show ever. Seriously, I love every episode and immediately become best friends with anyone that even mentions they like it. It's a problem. And one of my favorite aspects of the show has always been Hank's relationship with Bill. 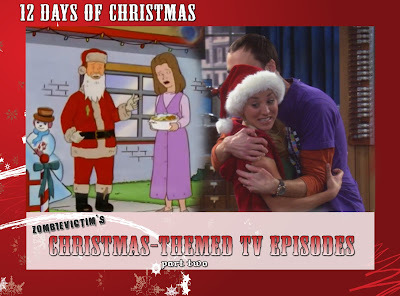 In this particular episode, Bill is being taken advantage of during the holiday season by a misfit and Hank is looking out for his neighbor and friend. Newsradio is a show that seems to get more and more lost amongst the shuffle as the years go on. It's really too bad as it's a great little show that features one of the greatest comedic performances of all time in Phil Hartman's Bill McNeil. This episode is particularly noteworthy due to the absurdity and, ultimately, the good feels.